As the known term for a blister-like ulcer within the mouth, herpangina occurs typically in childhood. Unfortunately, being an infection, herpangina can cause other health issues – we’re here to discuss what you need to know. In the past, the infection has been compared to hand-foot-mouth disease since they’re both viral infections found mostly in children. As a group of viruses known to affect the gastrointestinal tract, enteroviruses are to blame for herpangina. The immune system will typically jump into action as soon as it detects an enterovirus. Since young children and infants aren’t always equipped with the right antibodies, they’re more susceptible to these viruses. When it comes to herpangina, the main issue is its contagiousness. After spotting or hearing of an ulcer in the roof of the mouth or back of the throat, you should look to treat the symptoms and have the infection cleared as soon as possible. If left untreated, it can spread around a nursery or classroom. Although herpangina can affect anyone of any age, those around the age of 5 to 10 years experience it most frequently. Since it’s highly-contagious, breeding grounds can form in classrooms, camps, and other locations where children regularly congregate. In the U.S., researchers have found the problem to be most common in fall and summer. Both for yourself and your children, some health conditions can be hard to diagnose since the symptoms are very similar to other health issues. Luckily, the signs of herpangina can be spotted and tested more easily. For example, the primary symptoms one might experience include swollen lymph glands, sudden onset of fever, neck pain, difficulty in swallowing, sore throat, loss of appetite, and a headache. For smaller children, there may be an issue with verbal communication of symptoms, but indicators include excessive drooling or vomiting. Of course, ulcers may also be visible on the roof of the mouth or towards the back of the throat. In appearance, specialists suggest a gray color with a red border for ulcers; in the majority of cases, they clear within a week. Herpangina is easier to diagnose in older children who have learned how to speak and communicate their symptoms. However, in younger kids, look out for vomiting and excessive drooling. For many, especially with worried parents, this is the key question because you want to help your child feel better but you don’t want to exaggerate what may be a small issue. Therefore, we advise contacting the doctor if a fever measures above 106 degrees (or stays for longer than usual), if there are signs of dehydration, and if mouth sores remain for longer than five days. After paying a visit to your doctor, they can typically diagnose the issue with ease since the ulcers are unique in their appearance. 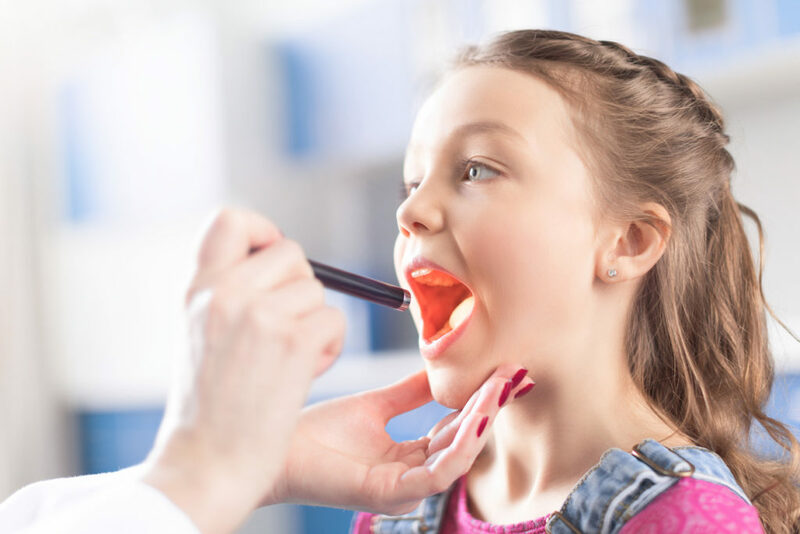 With a simple physical examination of yourself or your child, they can see the problem while also assessing all symptoms and your medical history. With herpangina, specialized diagnostic tests aren’t required. Regarding treatment, the goal is to reduce the symptoms while also keeping them under control in the days ahead. Depending on your age and a number of other factors – including your medical history and symptoms – doctor’s can recommend different types of treatment. A course of antibiotics won’t be especially useful since herpangina is a viral infection. With this in mind, the first suggestion would be acetaminophen or ibuprofen. It’s crucial that the patient doesn’t take aspirin since herpangina has been linked to the potentially life-threatening Reyes disease that is associated with a severe aspirin allergy. Elsewhere, topical anesthetics could be used to relieve any mouth pain (and sore throat), including lidocaine. Regardless of the treatment, the doctor will suggest an increased intake of liquids with a focus on water and milk; hot drinks and citrus-based beverages will worsen the symptoms. Strangely enough, many sufferers have found popsicles to ease throat issues so this could also be advised. Finally, you might be wondering whether you can avoid this disease altogether. First and foremost, you can take preventative measure by practicing good hygiene habits. For example, all the necessary rules apply such as covering your mouth when sneezing or coughing, washing hands after using the toilet, and washing hands before meals. If you teach your children the basic hygiene rules, you’ll decrease the likelihood of them suffering from herpangina too. If your child currently has herpangina, remember these rules when helping them to recover. Throughout the day, wash your hands and pay particular attention before and after changing diapers or dealing with mucus. Furthermore, try to keep areas of high activity clean for your child including toys, surfaces, and their beds. To avoid becoming the enemy of all other parents, we also advise keeping your child from school or day-care while recovering too. If you follow these tips, you or your child will be back to full health in no time! This entry was posted by Social Media Team on January 17, 2018 at 11:00 am, and is filed under Ear Neck Throat, Throat. Follow any responses to this post through RSS 2.0.You can leave a response or trackback from your own site.